Bogota is the business capital of Colombia and most of the top end hotels in this cosmopolitan city are very much business oriented. Style and design come as afterthoughts. For the leisure traveler in Bogota, finding a true boutique star was difficult. Then came B.O.G Hotel. Opened in 2012, the B.O.G. 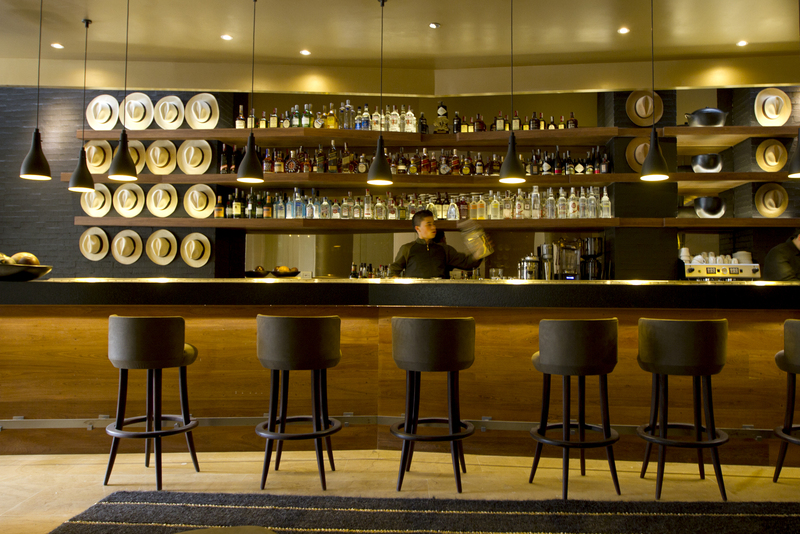 (as locals call it) was the first Design Hotels group member in Colombia and the only one in Bogota. It earned that distinction by being dedicated to design no matter how long it took to achieve. The owners hoped to have the B.O.G. up and running in a year and a half. It ultimately took five years to complete the design and construction of the hotel. And it shows. Portugese designer Nini Andrade traveled around Colombia for a month looking for inspiration and materials. Near the end of her journey she visited Bogota’s renowned Gold Museum. There, the designer found her muse. The B.O.G. lobby ceiling is inspired by gold panning. Glass with gold film around pillars in the lobby evoke a museum display case. The large sculpture under glass at the check-in desk was inspired by what the earth looks like after gold has been mined out of it. The elevator and halls are (very) dimly lit in the way a precious artifact is lit in a museum display case. All of the art and handicrafts in the hotel were made in Colombia including a collection of hats displayed on the wall behind the welcoming lobby bar. Marble tables, traditional grass skirts and more were also sourced from Colombian artisans. The overall bronze and gold palette feels very modern and materials used are intentionally tactile, inviting you to touch rough woven wall covering behind your sumptuous bed and pet the shockingly realistic zebra print and cowhide print wall paper squares. That same attention to detail is evident in the amenities and finishings in each of the 55 rooms as well which include a large and comfortable work desk with plenty of easy-to-access electrical outlets (in case you’re in town on business and pleasure), fitted mid-weight robes with light terry on the inside from Bogota Linen Company and 500 thread count bedding. At turndown your pillow is made even sweeter with nightly treats such as a candy-coated slab of chocolate dipped in edible gold, a chocolate covered blanched almond, Dulces Suenos (Sweet Dreams) mini atomizer fragrance or a lime linen water mini atomizer. However, the in-room stunners are the showers which are tiled from floor to ceiling in tiny gold squares, continuing the overall design theme of the hotel. Three jets provide an indulgent, massage-like experience and the space is designed to retain steam, creating a personal sauna. Rich and fragrant Calima bath amenities, made exclusively for the B.O.G., round out the experience. If you’re also looking for polished service, the B.O.G. can deliver that too. Guest Service staff are called Personal Assistants. Carlos, my PA, was on the ball from the first moment. For example, he noticed that a lovely fresh-baked dessert being brought to my room as a welcome gift had only one spoon. I was checking in with my husband so Carlos gently pointing out to the staffer that there were two in my party. Our treat arrived with two spoons. When the otherwise strong hotel WiFi suddenly took a turn for the worse the hotel’s IT guy (in a suit!) showed up immediately following my call for help. He determined where the problem was, fixed it, hard wired my computer in for good measure then installed my own personal WiFi router in my room. All in less than 30 minutes. The B.O.G. has a petite but fully equipped gym with sky lights, a steam room with piped in music and emerald green walls and tiles, a nod to the other precious commodity mined from the earth in Colombia. There’s also one massage room and a small park right across the street from the hotel will make outdoor exercisers happy. The rooftop bar and long, narrow pool (more for aesthetics than exercise) attract a local crowd as well as hotel guests with a tapas menu, good music and views over the happening Zona T neighborhood with its upscale Andino Mall (Tiffany, Dolce & Gabbana, etc. have shops there) and great restaurants including the famous Harry Sasson. Also within walking distance is one of the many Bogota Beer Company craft brew pubs where world-class microbrews and satisfying pub fare can be enjoyed. But don’t miss the chance to eat in the hotel’s restaurant which is headed by Chef Leo Espinoza. Her Leo Cocino y Cava restaurant was named one of the 85 best restaurants in the world in 2007 by Conde Nast Traveler and she created the La Leo restaurant at B.O.G. Hotel. B.O.G. Hotel is a member of Design Hotels and was listed on the 2013 Conde Nast Traveller Hot List. For more information and reservations visit http://www.boghotel.com/default-en.html. To read the Luxe Beat Magazine version of this article click on the title Gold Standard at the B.O.G. Hotel in Bogota Colombia.